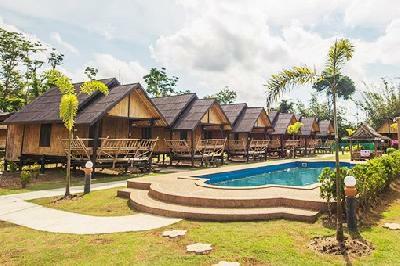 Two marital arts have seen a remarkable rise in popularity this year; Muay Thai and Kickboxing. To the average onlooker, these disciplines seem very much alike. 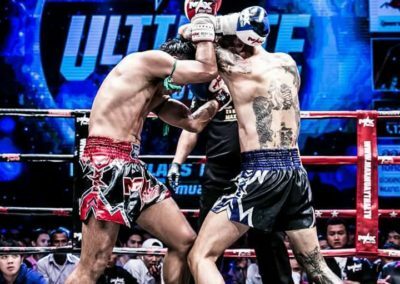 Admittedly so, there are examples of highly-successful MMA fighters representing both kickboxing and Muay Thai alike as the striking portion of their training, and many of the techniques taught in Muay Thai and kickboxing share a lot in common. 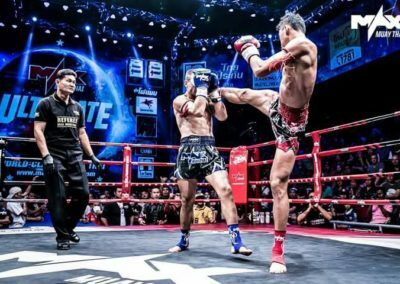 The notion is understandable, but on the other hand, there are also a lot of striking differences between Muay Thai and kickboxing that should also be taken into account when you are comparing the two. 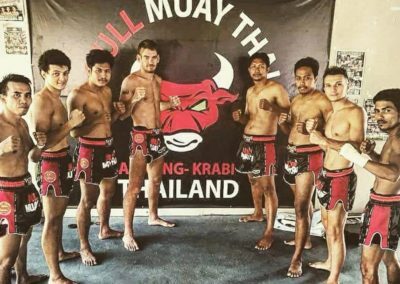 This article will take a closer look at both kickboxing and Muay Thai individually, the similarities they share, and where they differ. 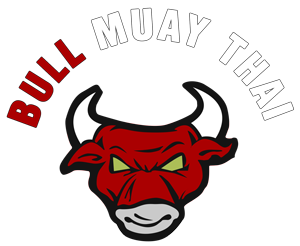 Muay Thai is a quite aggressive martial art with its entire focus being laid in dealing powerful blows using punches, elbows, knees, and kicks. It includes powerful leg kicks designed to damage the muscles in an opponent’s calves and thighs and to make it difficult for them to manoeuvre, elbows used to open up cuts in an opponent’s face, and using the clinch to control a fight, limit the damage you take, and land devastating knees and elbows from close quarters. 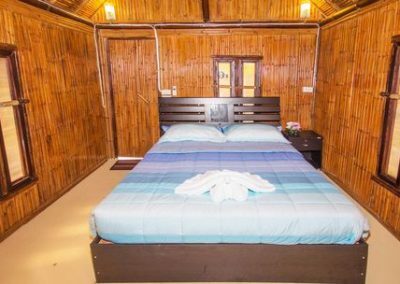 While Muay Thai certainly teaches plenty of defensive tactics, the real name of the game in Muay Thai is the offence, and the Muay Thai fighters rely on setting up powerful, fight-finishing blows to quickly dispatch an opponent. 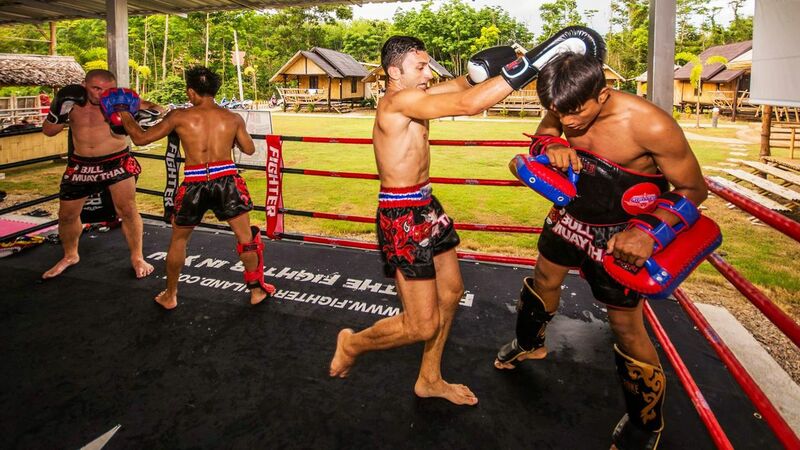 Though it will differ depending on the gym, training in Muay Thai is often intense and may feature near full-contact sparring, leading to both physical and mental toughness. Kickboxing teaches many of the same techniques and fundamentals as pure boxing does. A great kickboxer would likely feel quite comfortable inside a boxing ring fighting under regular boxing rules. That you can’t really say about Muay Thai fighters. Of course, kickboxing also incorporates kicks as well as punches like with Muay Thai, but Kickboxing also places a heavy emphasis on the footwork and movement in general. You will often see kickboxers circling and advancing in and out with fluid ease. The head movement is also a fundamental of kickboxing, and kickboxing tends to incorporate a very wide range of strikes, sometimes verging into blows that are almost exotic in nature, such as axe kicks and spin kicks, to only name a few. Muay Thai and kickboxing both are very strategic, teaching footwork, setups, and other techniques needed in order to evade blows from the opponent and land blows oneself. 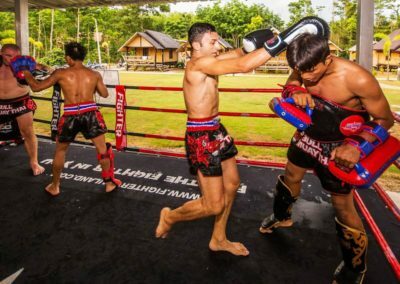 Likewise, many of the techniques taught in Muay Thai are similar to the techniques taught in kickboxing, especially the fundamentals. Both sports are fine striking martial arts and have been proven effective at the highest levels of competition multiple times. The first and most obvious difference that you probably will notice between kickboxing and Muay Thai is that Muay Thai is an eight-point striking system that involves striking with elbows and knees as well as kicks and punches whereas kickboxing on the other hand is a four-point striking system that teaches only punches and kicks. The second difference is to be found in the way the fighters move and attack. 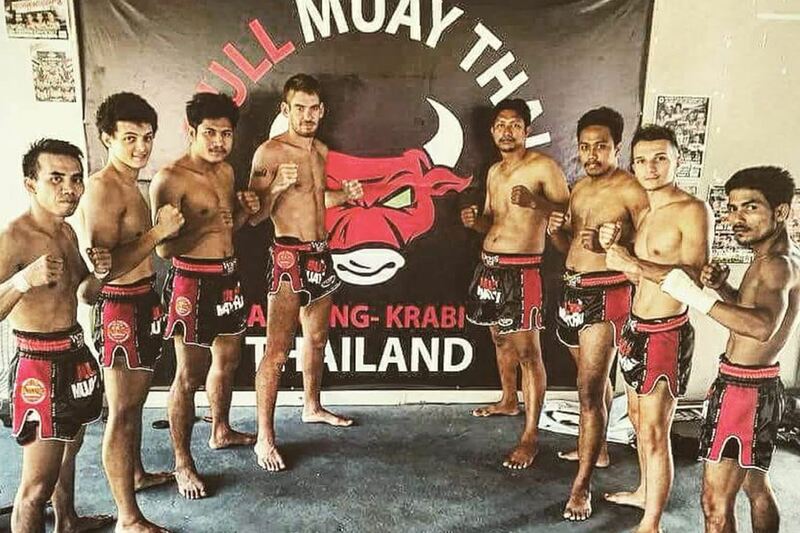 With Muay Thai, the fighters are moving almost primarily forward. Muay Thai fighters are taught to take their good time until an opponent gives them an opening then aggressively advance forward and strike. Often, these openings will come after an opponent has thrown a strike of their own, and counter-attacks are a fundamental part of Muay Thai. There is little head movement, weaving, and circling like you will see in boxing and kickboxing. The movement of kickboxers generally tends to be a bit more fluid and defensive in nature compared to the movement of Muay Thai fighters. Kickboxers will use their footwork and angles a little more to set up attacks rather than relying on aggressive forward motion and counter-attacks. That’s not to say that fluid footwork isn’t found in Muay Thai at all – but you could say that it’s just a little more prominent in kickboxing. The types of strikes you will see in the two martial arts are different as well. There are very few artistic or exotic strikes taught in Muay Thai. Instead, Muay Thai prefers simple, powerful strikes that don’t throw you off balance as much if they miss. With kickboxing, though, you will learn a much wider range of strikes. Some of the strikes taught in kickboxing may be a little more difficult to pull off and may throw off your balance more if they miss, however, they do add to a kickboxer’s arsenal and can be highly effective if an opponent is not expecting them. Lastly, the manner in which Muay Thai fighters and kickboxers throw kicks also differs. It’s very rare to kick with your foot or lower shin in Muay Thai. Instead, Muay Thai fighters are taught to land blows using the middle portion of their shin. With kickboxing, though, there are a wide range of kicks that land using the foot, lower shin, and middle shin alike. 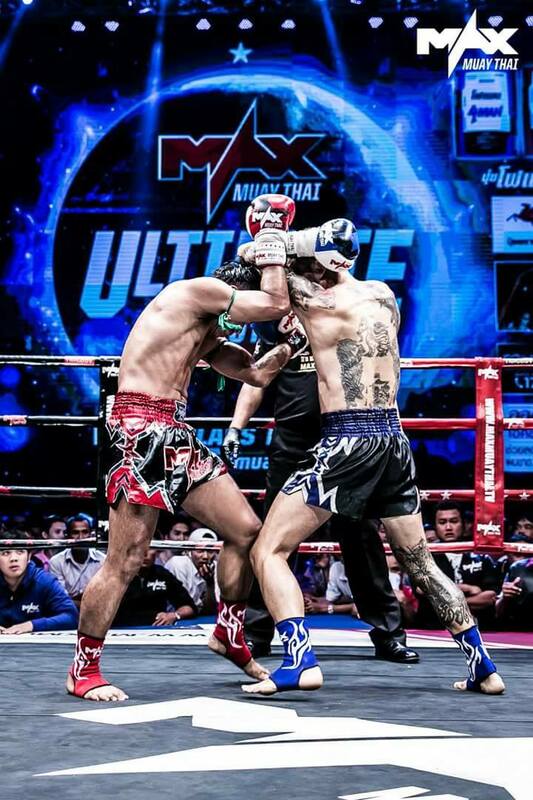 Muay Thai is often seen as the more complete martial art of them all since it incorporates the clinch, elbow strikes, and knee strikes while kickboxing does not. However, a person could still stand a lot to gain by being trained in both martial arts. 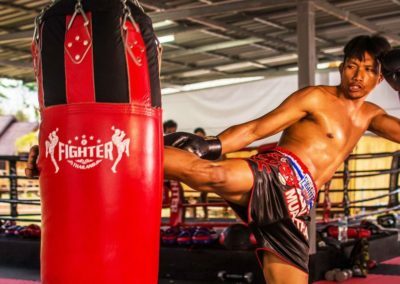 Muay Thai fighters could use kickboxing to improve their movement and learn a few more of the skills and techniques taught in pure boxing. They could also use kickboxing to add a wider range of more complex strikes to their arsenal which could be used to devastating effects in the right scenario. Meanwhile, a kickboxer training in Muay Thai would benefit greatly from counter-attacks and aggressive nature of Muay Thai, how to put a little more devastating power behind their blows, and how to be effective from the clinch and use elbows and knees to punish an opponent in close quarters. In short, both Muay Thai and kickboxing are two highly efficient martial arts – arguably the best two striking martial arts available. 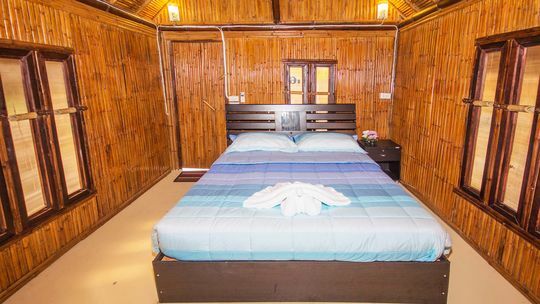 Though they have a number of key differences, you really can’t go wrong with either one. Are you ready to give Muay Thai a go? Get in touch via our contact form to find out more about how to sign up for our classes and how to get to us.